If so, we want to know all about it – and honour that flexibility and commitment in the first Scottish Top Employers for Working Families Awards. 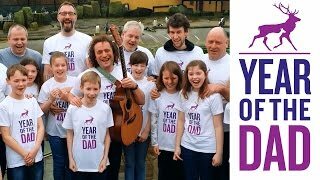 Launched by the Family Friendly Working Scotland programme – a collaboration between Fathers Network Scotland, Parenting Across Scotland, Working Families and the Scottish Government – the 2015 awards include ‘Best for all Stages of Fatherhood’, which is sponsored by Fathers Network Scotland. Organisations are asked to tell the judges about the policies, practices, culture and initiatives that mark them as great candidates for the awards. They are encouraged to use case studies to bring applications to life – and these might be used more widely (with their permission) to help other employers see what can be achieved. With the introduction in April 2015 of new Shared Parental Leave legislation – which gives new mothers and fathers the option to share leave during the first year of their child’s life – judges will be looking particularly closely at the ways prospective fathers are given information about their options and looking out for positive attitudes to opportunities for flexible working. Currently there is an ingrained cultural assumption that flexible working is only for women with evidence showing that even when men do request flexible working there is a greater chance that their application will be declined. Research by the charity Working Families found that younger fathers are more disengaged in the workplace, and that the workplace barriers they face in being able to participate in family life as they wish are driving dissatisfaction and lowering engagement. It makes sense that an employer looking to improve employee engagement would have fathers’ needs high on their agenda. Paid paternity leave and senior level champions for fathers are also the sorts of initiatives we’d hope to be recognising. This is about creating a culture where both men and women feel confident and comfortable working flexibly without being made to feel that somehow it will be bad for their career. Employers need to not only introduce effective flexible working and family friendly policies, they also need to make real efforts to change workplace culture so that flexible working is highly visible and normalised. A culture where employees are recognised for results, not just the hours they are seen to be in the workplace. Many employers are realising the huge organisational benefits of flexible working and an agile workforce, including improved recruitment and retention alongside increased productivity, raised employee morale and commitment and reduced absenteeism. Employees clearly benefit from reduced stress and an improved balance between work life and family life. The awards will shine a light on Scotland’s employers who are forging ahead, with huge and lasting benefits for organisations, employees and their families. Legislative changes such as Shared Parental Leave already show an appetite for change. However legislation alone is not enough: there is still a road to travel in terms of breaking down cultural barriers, particularly for fathers, in our workplaces. The Scottish Top Employer for Working Families Awards provides a platform for employers to shout about good practice and gain real recognition for their organisation. So if you are an employer who is committed to family friendly working or if you are an employee who happens to be working with a progressive organisation please consider entering the Scottish Top Employers for Working Families Awards and get your organisation on the map. Award applications close on 6 February and are free to enter. Winners will be announced at a special event at the end of March.